* T. Shortell and J. Krase. 2010. On the Visual Semiotics of Collective Identity in Urban Vernacular Spaces. Paper presented at the XVII ISA World Congress of Sociology, Gothenburg, Sweden. We’ve got a couple of new presentations coming up, one in Turkey and the other in Milan. I’ll post those after the respective conferences. 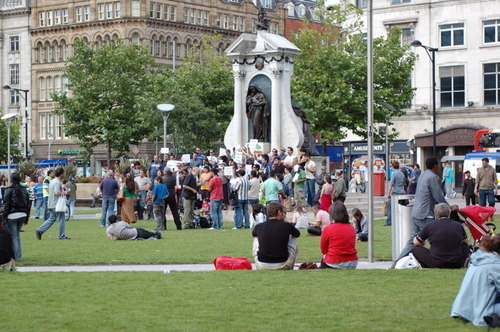 Photo: ‘Democracy in Iran’ protest in Piccadilly Gardens, Manchester, 2009. By Timothy Shortell.